Non-compliant balloon catheters provide uniform radial force along the vessel wall at any inflation pressure. This feature can make them particularly valuable tools during percutaneous coronary intervention (PCI), especially in cases that involve large differences in vessel diameter across lesions or bifurcation anatomy. Results from the COronary BIfurcation Stent (COBIS) II registry showed that non-compliant balloons were associated with favourable procedural and long-term clinical outcomes compared with compliant balloons in patients undergoing bifurcation PCI.1 Experience from daily practice is also helping to expand our understanding of how best to use such balloons in the clinic. The following case provides an example of treatment of a stent restenosis in bifurcation anatomy, highlighting the important role the Accuforce® non-compliant PTCA balloon catheter played in achieving optimal stent apposition in this challenging scenario. Successful PCI of the left anterior descending (LAD) artery approximately 10 years earlier. A 77-year-old man presented at the clinic with stable angina and a positive treadmill stress test. Around 10 years previously he had undergone PCI of the LAD. 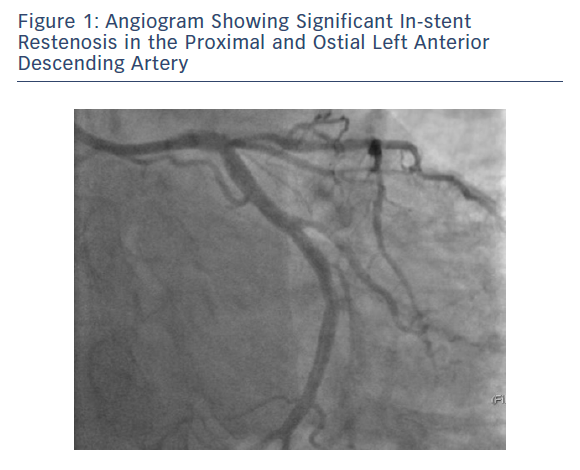 Coronary angiography revealed singlevessel disease in the proximal LAD, with 70 % in-stent restenosis which involved the ostium (Figure 1). After discussion, it was decided to proceed with angioplasty. Access was obtained through the right radial artery using a 7 Fr Glidesheath Slender®. Using an XB 3.5 7 Fr guide catheter, three Runthrough® NS Hypercoat™ guidewires were advanced to the LAD, left circumflex (LCx), and ramus intermedius arteries. 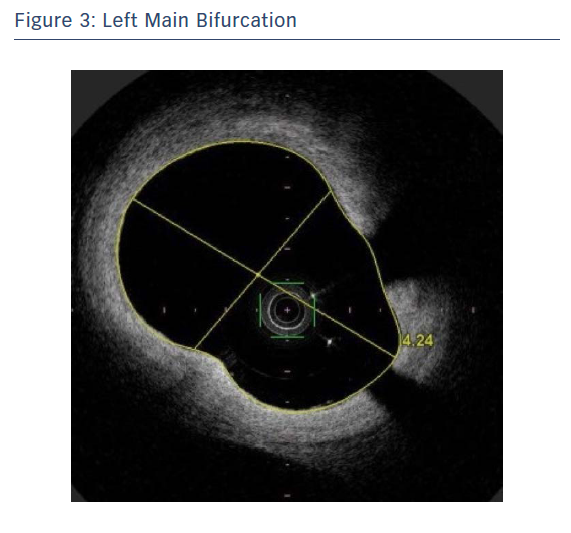 Optical frequency domain imaging (OFDI) was then performed to guide preparation of the lesion. 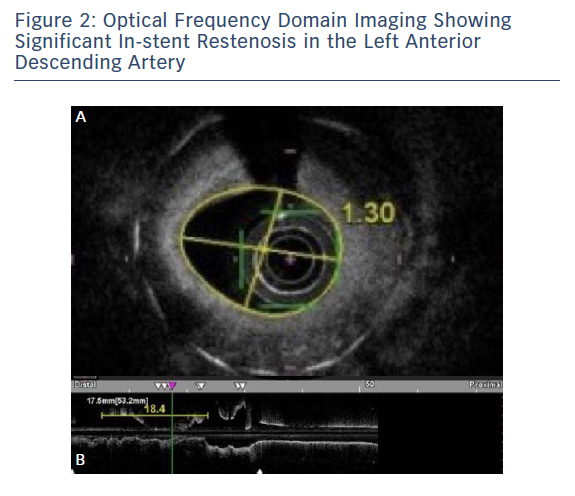 OFDI showed significant in-stent restenosis in the LAD: 18 mm in length, with an inner lumen diameter distally measured as 1.3 mm (Figure 2). The left main bifurcation was 4.2 mm in diameter, highlighting a significant mismatch between the proximal and distal luminal areas (Figure 3). Pre-dilatation was performed using a 2.5 × 8 mm Accuforce noncompliant balloon at 20 atm, followed by a 3 × 10 mm Flextome™ cutting balloon. A second OFDI was then performed, which showed a significant improvement of the luminal area (Figure 4). OFDI was also used to guide stent placement. A 3.5 × 18 mm Ultimaster® stent was placed in the proximal LAD up to the left main branch, and was post-dilatated with a 4.5 × 8 mm Accuforce® non-compliant balloon at 16 atm. 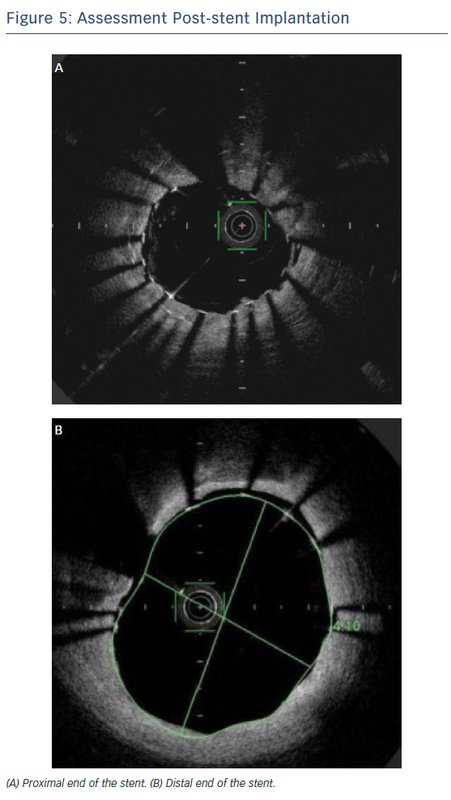 After a third OFDI assessment to check stent apposition (Figure 5), it was decided to optimise the result with a 5.0 × 6 mm Accuforce® non-compliant balloon at 18 atm, which resulted in good stent apposition and overexpansion at the left main bifurcation. 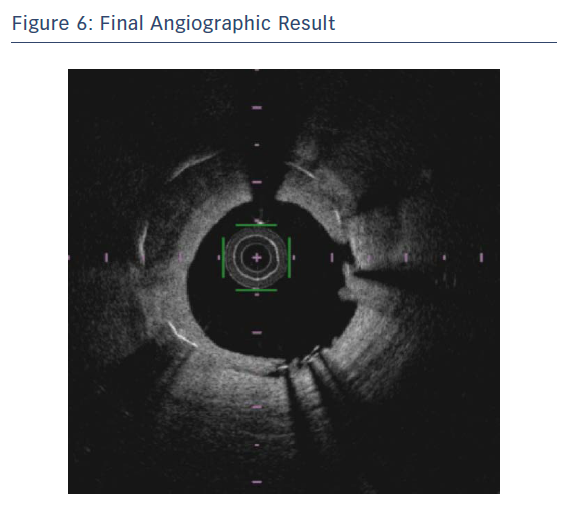 A good final angiographic result was observed (Figure 6). Thrombolysis in MI flow 3 was achieved, with no residual stenosis. No immediate complications were reported during the procedure, and by follow-up, the patient had experienced a significant improvement in symptoms. Optimisation of Ultimaster® stent placement through pre- and post-dilatation with the Accuforce® non-compliant balloon played a crucial role in the successful treatment of this symptomatic patient to ensure good stent apposition across this complex anatomy. This case represents the importance of careful patient evaluation, procedure preparation, and the value of OFDI guidance in assessing lesions and stent placement for the best possible outcomes. The innovative design of the 7 Fr Glidesheath Slender® leads to a 1 Fr reduction in outer diameter while maintaining a large inner diameter. This also made it possible to complete this complex procedure transradially, which could otherwise have been challenging. Park TK, Lee J-H, Song YB, et al. 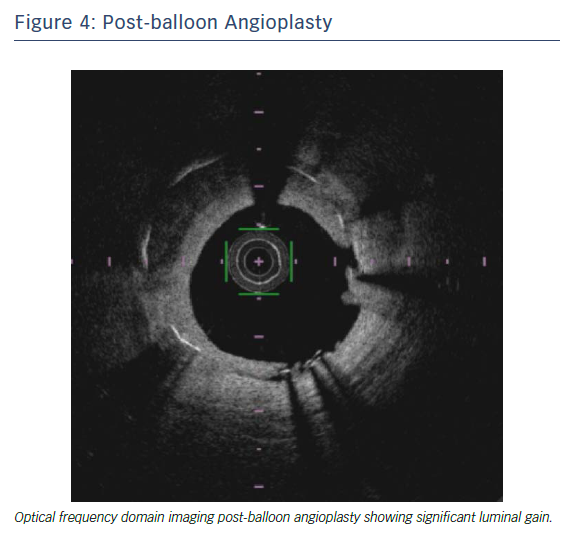 Impact of non-compliant balloons on long-term clinical outcomes in coronary bifurcation lesions: results from the COBIS (COronary BIfurcation Stent) II registry. EuroIntervention 2016;12:456–64. https://doi.org/10.4244/EIJV12I4A79; PMID: 2743660.